Opening Thursday, April 11 at Unix Gallery. On view through May 18. Though many people still deny it, climate change is here to stay, and it will only get worse as time goes on. It’s even commonplace to hear people casually joke about how nothing matters because climate change is going to kill us all soon enough anyway! 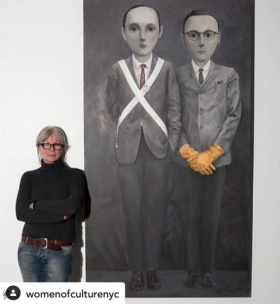 While it’s not quite as darkly humorous as such quips, the latest crop of work by painter Ellen de Meijer comments on the type of elite who think that sure, global warming is a thing, but I can just keep living my fancy life and everything will be fine, we’ll just adapt. Feast your eyes upon a lanky, formally-dressed man furnished with a pout and arm floaties, another large-eyed man with a hat made of newspaper, and more, and remember that global warming has no income bracket. Opening Thursday, April 11 at 322A Canal, 6 pm to 9 pm. On view through April 28. It’s easy, when walking down Chinatown’s Canal Street, to wander past a bevy of outdoor kiosks selling all kinds of wares like bags, watches, and accessories for your phone. Later this week, there’ll be something different nestled among these shops: an art exhibition by Jo Shane that delves into the Instagram algorithm’s effects on our daily life. Rather than installed in a traditional gallery, Shane’s show will look a lot like the merchandise displays in its midst. Her prints, portraying the moment you swipe past an Instagram Story and are greeted with an ad, will be mounted on plexiglas and displayed on the type of device typically used to display a phone while someone is driving. Will seeing the algorithm’s handiwork IRL make its mysterious forces make any more sense? Only time will tell. Opening Saturday, April 13 at Last Rites Gallery, 6 pm to 9 pm. On view through May 11. Bodies are weird, even when they’re perfectly healthy. They’re strangely-shaped flesh sacs filled with red liquid, white rods, and squishy shapes. 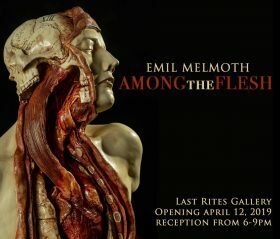 You can go to a lover or a science museum to check out bodies up close and personal, but starting Saturday, you can also go to Mexican sculptor Emil Melmoth’s new exhibition Beyond the Flesh, opening at Manhattan’s Last Rites Gallery. The art space celebrating “contemporary surrealism” will be filled with Melmoth’s morbidly innovative creations of blood, bones, and organs, which eschew total biological accuracy in lieu of something far more fantastical.